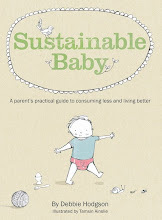 Sustainable Baby: Elimination Communication goes mainstream? I was so amazed to read an article on EC in Practical Parenting magazine this month! The intro paragraphy-thingy described it as a 'growing trend' - this was totally news to me! But very happy news all the same. The article also referred to it throughout as Potty Training or Toilet Training, which I think might be misleading - I reckon EC should involve you learning about your baby, rather than teaching her to do something. However, whatever it's called, if it's brought more into mainstream Australian consciousness I couldn't be happier! Recently I became aware that even people who seem like they have an open mind can be totally outraged by what they perceive as giving babies a complex about eliminating. It doesn't make sense really - the real complexes surely happen when toddlers and their psychological complexity are involved. With newborns and tiny babies, on the other hand, it's simply about the basic human need to eliminate. No obsessing or complexes required.